Lately a family has come into my life that has great need. I won’t go into too many details, but this family is currently living in a single wide mobile home with a total of 11 people. The wife has 2 children of her own (almost grown), and has taken in 3 children from her brother who is in prison, just to keep them from getting into the system. They are staying with her and her husband as they live with a friend and her two husband and their two kids. While the husband just got employed, they are in a tight situation. They know living in such tight quarters isn’t a way to live – but they need just a little boost to help get ahead for once. There are things that most of us don’t even consider privileges that they spend time and energy calculating and considering. We put down a security deposit without blinking. We fill up our cars with gas on our way to work, as if it were a chore instead of a privilege. We even go to church on Sunday with empty cars, not even thinking that many can’t go to church because they have to save the gas to go to work on Monday. All things considered, I am feeling more confident that this family entering my life isn’t a coincidence but God’s provision. He knows what they need, but he also knows what I need. I need more humility and less pride. I need to focus on myself less and others more. I need to see and understand his grace not just with my mind but with my heart. As of yesterday, I see specifically how God is demonstrating his grace to me. For a couple of weeks, I had been reaching out to a couple of other community groups in the church. One in particular showed interest, and I went about setting up the initial meeting with this person and the family. Unfortunately, an emergency came up and the family couldn’t make it. The second meeting they couldn’t make either because they had taken the children to see their father and came back later than expected. As I approached setting up the third meeting, the leader informed me that their group will pass on helping because there are “too many red flags”, and that they couldn’t understand if the family needed help why they couldn’t make time for it. My heart sank. I understood completely why they would say that. The family should’ve made every possible attempt to make the meeting. While the emergency couldn’t have been avoided, perhaps the trip to see the father could’ve been better planned. There are dozens of red flags about the situation. However, the more I sat and read the email, the more I realized how generous God’s grace is to me. Imagine the hundreds and thousands of red flags that should rightly stop him from loving me. My flags say that I’m a gossiper, that I’m prideful and take credit for what he has done, that I’m an adulterer by loving worldly things instead of loving God. God has more reason that anybody else to look at all the brokenness in my life and turn from it. Yet God does what man can’t do. 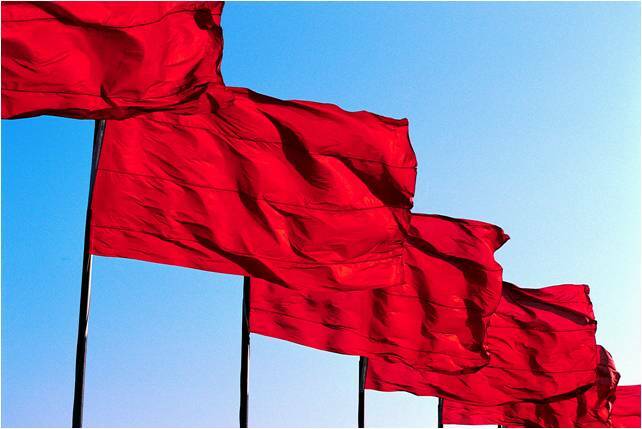 He can look at red flags and rejoice in them, because he sees them as signs that we need his grace. He looks at my red flags graciously, because he knows that I’m no longer identified by them. I pray that I would understand in this moment what God is telling me. I pray that instead of letting one man’s opinion of a situation influence my own decision to help – that God would instead show me how to love them so that they may know the only true God who can love them, red flags and all.